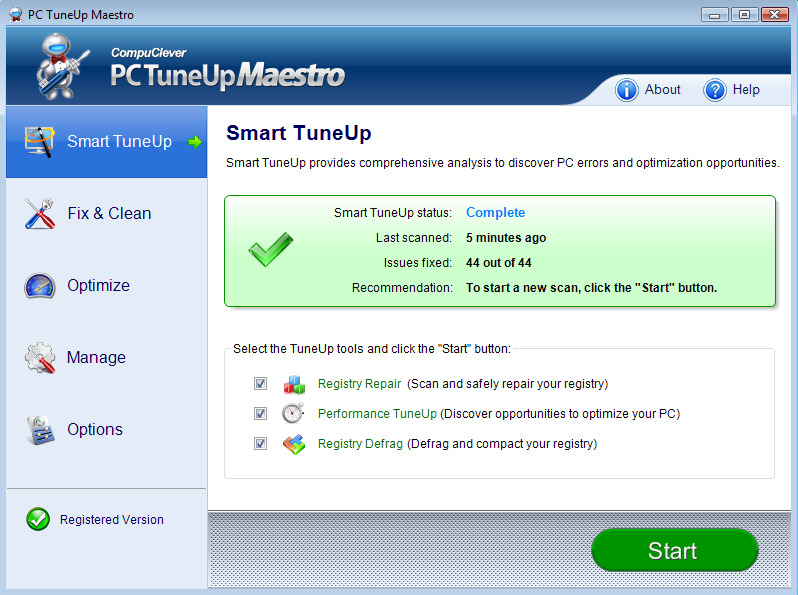 PC TuneUp Maestro easily and safely improves slow computer performance while eliminating system errors and crashes by offering a variety of simple but powerful push-button maintenance and optimization tools.System Registry Scan&Clean quickly seeks, cleans and removes erroneous or obsolete registry entries, to keep your computer system stable and free of performance issues,Registry Defragmentation removes gaps and fragmentation to produce a compact registry that takes up less system space and consumes fewer memory resources. The result is your computer has the best possible access to its registry, so system and application speeds are improved. PC Optimization provides a detailed list of recommended tweaks intended to improve both computer performance and the actual experience of using a computer. To save time and keep things simple, the Smart PC TuneUp tool provides System Registry Scan&Clean, Registry Defragmentation, and PC Optimization features, all in one place at the click of one button.Backup&Restore gives you the power to restore your system to the way it was before a virus or crash occurred by creating backup copies of your files at different points in time. An auto-backup feature creates a snapshot every time a repair or tuneup is performed, helping you protect your entire system.StartUp Management identifies what applications or programs launch at system startup. You can then prevent unneeded programs from starting when you turn on your computer, freeing up system resources and speeding up PC startup times.The Scheduler helps you easily automate system registry scan, clean, and defrag tasks, and create automatic registry snapshots for backing up and restoring your PC. There is also easy access to Hard Disk Clean and Hard Disk Defrag, two tools provided by Windows to optimize hard disks.Engineered by CompuClever, PC TuneUp Maestro protects your system while enhancing computer performance, speed and stability.